Tyler is a precious young boy full of wonder with an infectious personality. Over the last 9 years, he has endured many different medical issues with no underlying answers. While doctors tried to reassure his mom at birth that everything was okay, mother’s intuition told her otherwise. At just 6 months old, Tyler began intensive therapies for severe developmental delays. As the years passed, his family sought help from many different specialists, including a geneticist. Tyler’s geneticist ordered genetic tests that continued to come back with no clear answers. Tyler has at least 13 different diagnoses, but the one diagnosis to connect all of them could not be found; until now. U.R. 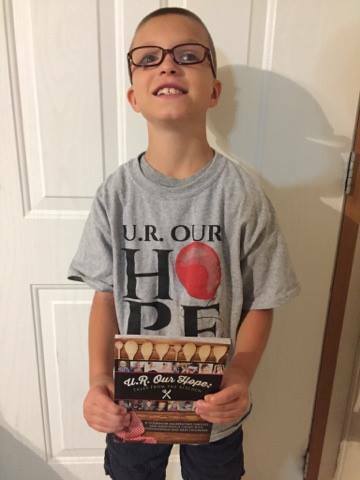 Our Hope has been on the journey with Tyler and his family over the last several years. Through our partnership with GeneDX, a genetic testing company, the family was able to finally receive Whole Exome Sequencing in November of 2016. Whole Exome Sequencing (WES) is one of the most advanced genetic tests currently available, however, due to cost and insurance struggles it is one of the most elusive tests for families. As a partner, GeneDX was able to work with the family’s insurance to obtain coverage, minimize out-of-pocket costs, and ultimately find a diagnosis. The family is relieved to finally have an answer to connect all of his diagnoses. After finding the diagnosis, the family learned of a bi-annual Joubert Syndrome conference which happens to be taking place this July in Phoenix, Arizona. At this conference, his family will have the opportunity to present Tyler’s case to some of the leading doctors and researchers of this condition. They will also have the opportunity to meet other families and individuals living with Joubert syndrome. They are currently fundraising to be able to attend the conference. You can contribute to their GoFundMe account or attend their Medical Benefit in San Marcos, TX next month. Tyler is just one of the individuals your donations have helped us support in the last year. With your continued support, we have at least 8 more children and adults who were recently diagnosed or are waiting on test results and hoping to have answers this year. Thank you for supporting our mission and families like Tyler’s!